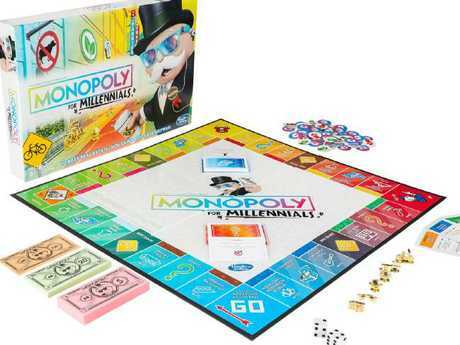 Hasbro’s new Monopoly For Millennials. Millennials have long been maligned for their inability to "adult" - from avoiding marriage to quitting their jobs to travel. But perhaps most central to the millennial MO is the issue of property investments - of which they infamously have none. 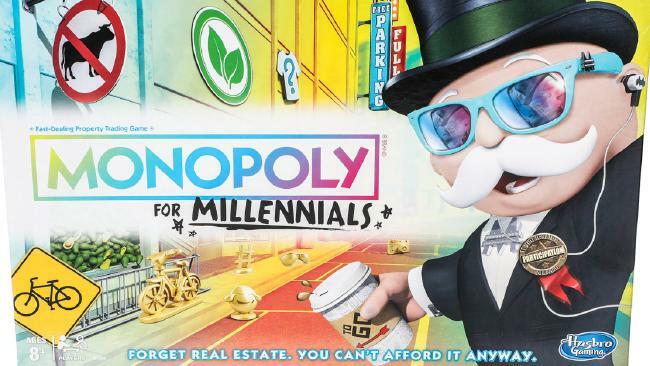 So the cynical game-makers at Hasbro devised Monopoly For Millennials. "Forget real estate. You can't afford it anyway," the cover of the $27 (get it?) board game reads. Players don't win with money to buy homes or railroads, but instead collect "experience points" by earning rewards such as a three-day music festival or going to a vegan bistro - because memories "last forever". Perhaps hitting the closest to home was one of the "hottest destinations" of all - couch-surfing. Player pieces include a few things millennials simply can't live without, such as a camera, sunglasses and a hashtag. "Money doesn't always buy a great time," reads the description. "But experiences, whether they're good - or weird - last forever."